This weekend we’re going to an apartment-warming party for our friend Becca. It is for drinks and hour d’oeuvres, and guests are welcome to bring dishes. I am sure that this is a familiar type of event for most of you. Either you have been to a cocktail party or shower like this recently or you’ve thrown one. They are nice because people can mingle and nibble, but you don’t have to concern yourself with a big dinner or anything formal like that. In excited anticipation for this party, I’ve decided to feature a few quick and easy finger food dishes that will be huge party hits, whether you’re bringing them to a party or throwing it yourself. And some of them are even healthy! Mini quiches: This is what we’re bringing to Becca’s. You pick whatever ingredients sound delicious. Broccoli, tomato and cheddar. Or bacon, chive and gruyere. Or spinach and mushroom. You can’t go wrong, and people will love them. Make them in muffin wrappers in a muffin tin. Julia says, “be sure to spray them!” You can go crust or no crust. Julia did a great crust made of Cheez-It crackers and a little (uh oh) butter, and pressed the mixture in the bottom of the muffin wrappers with a shot glass and let them set in the fridge for a few minutes. Mix together about 0.5 large eggs and 1.5 ounces of skim milk per quiche. Add a scoop of your ingredients to each muffine wrapper and top with sprinkles of cheese. Cook on 350 degrees for about 18 minutes, or until a toothpick comes out clean. A real winner! Insalata caprese skewers: These are terrific because they are easy, look really bright and colorful and everyone loves them. Just buy toothpicks or little skewers, grape tomatoes, basil leaves and the little balls of fresh mozzarella. I would ratio about 1 ball of cheese per tomato and probably 1 basil leaf per two tomatoes. But they can be as big or small as you want, and they’ll take ten minutes. Chicken Caesar dipping skewers: Not into Caprese? Try Casesar! Do the same thing as above but use croutons, parmesan hunks and a chunk of grilled chicken. Make your own croutons by quickly crisping up some bread hunks in some olive oil, salt and pepper, and they’ll be delicious as well as “skewerable.” Serve with a little Caesar dressing for dipping. Another easy dish that I would love to see (and eat) at a party. Nutella and banana Panini: For a sweeter and completely killer option, use the amazing pairing of Nutella (that jarred chocolate, hazelnut stuff) and bananas. Get some bread rounds, spread on the Nutella and put two banana slices on there. If you want to get fancy and have the right setup, you can grill these (like grilled cheese) for an extra element of gooey goodness. Spinach balls: These mysterious finger foods are Becca’s secret specialty, and she’s making them for the party. I hear they’re healthy, addictive and unbelievably tasty. I’ll try her for the recipe once I’ve had them, and share the secrets I gather here. If I fail, then I’ll at least update with a post-party review of them. 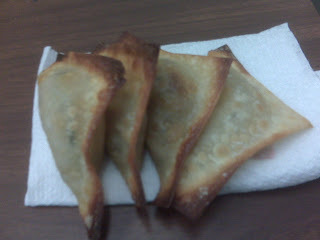 Pineapple cream cheese wontons: The return of my wonton wrappers! Mix crushed pineapple, reduced fat cream cheese and some finely diced scallion together and put about 1-1.5 teaspoons in the middle of every wonton wrapper. Brush the edges with some water or egg wash and pinch them shut. Bake on 350 for 8 minutes until browned, or pan fry for a minute or two on each side. Serve with a little teriyaki sauce and people will have a field day with this awesome flavor combo. They’ll love you for these. Pigs in a blanket, rethought: Classic finger food. Inspired by a fancy take on this at a restaurant recently, use frozen puff pastry instead of the heavy Pillsbury stuff, and whatever hot dogs you'd normally use for these 'pigs.' Top each slice with a little sauerkraut and spicy mustard. Mouth watering, and people will be fighting each other for them. Mini pizzas: Buy a roll of pizza dough. Pillsbury’s is actually not loaded with any butter. Roll out the dough, cut it into 2-inch rounds and top with sauce, cheese and the pizza toppings of your choice. You can get creative. Bake them on a sprayed cookie sheet for about 18 minutes, or until crust is golden. They’re little and divine and who doesn’t love pizza? So there you have it. The menu for your next party. Well, at the very least, some inspiration. I hope Becca and her guests read the rest of these and get as hungry and inspired as I just got writing them.